Industry leaders of custom soap manufacturing, soap fillers, soap contract packaging, and proud manufacturer of Cosco Green Soap and Tattoo Green Soap. Industry leaders of custom soap manufacturing, soap fillers, soap contract packaging, and proud manufacturer of Cosco Green Soap and Tincture Green Soap. 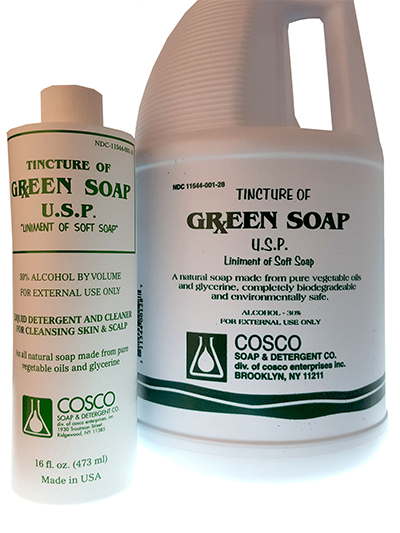 Cosco Tincture Green Soap U.S.P. Cosco Green Soap is an all natural soap made from pure vegetable oils and Glycerine. Our Cosco Green Soap is the original and most recognized Tattoo Green Soap on the market. Used in all aspects of the Tattooing and Piercing processes, Cosco Tattoo Green Soap is the industry standard and can be found in Tattoo shops all throughout the world. Manufactured in the USA since 1966 under strict standards, our product shines above it’s competitors and knockoffs through it’s reliability, quality and integrity! Please contact us for more information or if you are interested in becoming a distributor. Cosco Soap distributes a wide variety of cleaners, soaps, degreasers, and detergents to a wide range of industries. We specialize in soap manufacturing, soap filler, tattoo green soap, and soap contract packaging! Founded in 1966, Cosco Soap is the leader of soap filler and custom soap manufacturing. We are experts in soap filling, soap contract packaging, and tattoo green soap. Have any questions about our products, custom soap manufacturing, tattoo green soap, or soap contract packaging? Contact us today and one of our representatives will be happy to help!